In the four years I have been in Korea I have never been to the west coast. I always imagined it to be a flat land where most of the country’s rice is grown. I have seen brief glimpses of the tidal flats from television documentaries about coastal cities. Most of these programs showed people knee-deep in muck searching for clams and such. 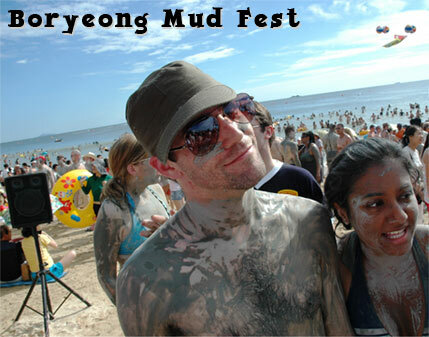 So when I first heard about the “mud fest” in Boryeong I wasn’t all that interested. Then one night a friend told me she and a few others had been there before and it had been a blast. The only problem she said, was getting to the west coast from the east coast. This time she rented a bus for the occasion and was selling tickets. Well, a bus load of friends, a few beers, and no worries heading for the west coast sounded like a good time so I joined the tour. 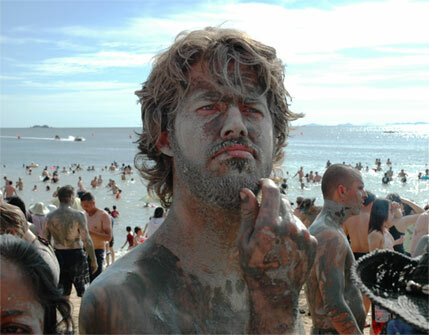 So what if I was going to the flatlands of Korea with it’s mud and muck. I grew up in the flatlands of Canada in it’s mud and muck. I know how to muck around. We left Pohang at eight on Saturday morning. It was cold, grey and raining. A typhoon off the coast of Japan was whipping up the wind. ‘Perfect weather for ducks and mud festivals,’ I thought but then who hasn’t been to at least one music festival that has turned into a mud fest? Woodstock? Yes, I was preparing myself; getting into the right state of mind. The mind is an amazing thing. Some people practice meditation as a self discipline. Some people practice the art of self deception. I don’t practice. I just mix the two together and hope for the best. I wasn’t prepared for the sunshine thirty minutes out of Pohang. I can’t sleep when the sun is shining. I thought I would sleep on the bus. Neither can I sleep when we are zipping by new scenery. And surprise, the landscape is not flat! Somebody should talk to the Korean documentary people because they are selling this part of the country short. So here we are on a bus with lots of sunshine, rising mountains and winding roads. What will the beach be like? I love surprises. Surprise! The beach is a beautiful golden swath of sand that stretches out forever. An infinite number of restaurants line the adjacent road and everywhere people are covered in mud. The pictures tell the rest of the story. Thanks Erin and Steph for organizing the tour.